Josef’s classic burger from Josef Burger Bar is a decent hamburger. It’s a serviceable burger with plenty of mouthfuls of common flavor that are overshadowed by an off-putting construction that tips the hamburger’s burger taste balance towards bread. It is a burger for which an obese amount of some ingredients suddenly takes over to deliver a messy burger experience. Thus, the ensuing burger struggle, unbalanced taste, and awkward construct places Josef’s burger a little above mediocre. The first bites of the burger are defined by pure bread, followed by some salad and sauce – loads of sauce, if for anything, this is one saucy burger. It’s all optional though, as this is a hamburger one can pick and choose for. It won’t be until a few mouthfuls when one finally has a chance to taste the double beef patties… The buildup would not have been more exciting if it took one more bite of bread to reach, but it wasn’t; the result is a decently flavored meatloaf beef patty, without a strong taste of clean meat and a mixture of other ingredients. And as one might expect from an overtly seasoned patty, a somewhat rubbery texture. The rest of the ingredients are experienced in parting bouts, as they appear and disappear from the burger while one contests to keep it together. The sauce intermixture of cream with a large dollop of BBQ and sprinkled coriander and chopped onion freshly explodes from within, engulfing the burger and one’s fingers in a zesty ridden mess – delivering more taste than one would appreciate from any of these. The vegetables – the tomatoes and the lettuce, are crisp and tasty, but one is left with the arduous role of forcing these in place in order to enjoy a three star rating burger taste balance. This isn’t a bad hamburger, once you figure out to break and reposition the patties as to cover the whole area of the bun; which by the way, has a splendorous spongy feel and taste to it. But the whole process of reconstructing the burger and mediocre ingredients detract from the overall hamburger experience, taking away from its enjoyment. For NIS 58.00 (HKD 125.50) Josef’s burger is actually worth a try if you’re in the area and desperate for a hamburger. The fries are alright. It’s a neat little experience – enjoying a burger in one of the world’s oldest cities, that like the burger, has been built, destroyed, and rebuilt several times over. The Smokin’ B-boy burger from Three Buns is an exquisite hamburger. Starting with a confusion of slight dryness with juicy undertones, the hamburger has a burger taste balance that enhances with every bite, increasingly turning more luscious. The bread, patty, and everything in between begets a whole range of flavors that will romance anyone’s taste. It’s as if each ingredient ripens between the two buns and each mouthful intensifies in savority, intensity, and delivery. The ingredients in the b-boy’s burger taste balance are actionable, presenting themselves clearly in each bite. At first the beef patty might feel tightly packed, hinting towards a patty that has been prepped with some binding… but comes as a nice surprise as the beef’s flavor remains somewhat untouched, with hints of great light seasoning. What glistens in this hamburger is a glorious buttery taste that is delivered in mystery… it’s not butter, or it may well be, but it has the richness, salt, and delight of ghee. It could be the blend of a smoked cheddar cheese, that is subtle enough to pass discreetly, combined with thick layers of a dell beer & treacle streaky bacon, that is juicy, and both soft and jerky. Or perhaps that buttery taste emanates from the smoky mayonnaise that copulates with the hamburger’s BBQ ketchup, trio-ed with a bawang goreng that is bawang delicious. The burger construction is simple but stout, it feels tight, and with a bun that is sturdy and absorbative, ruggedly built. The bread fills with great rich drippings and is tough enough to support and capture the flowing flavors within, but soft on the burger’s burger taste balance. For HKD 128.00 this is a great burger to try, and the naughty fries are good (though the béarnaise sauce get’s a little lost). The Smokin’ b-boy is a great hamburger experience that progressively improves with each bite. It’s a slow buildup that finds a flurry of tastes engulfing the senses. The last bite was something memorable, every descriptor – smokin’, BBQ-uey, streaky, meaty, and gorengy, come together and proceed to deliver one memorable and demanding bite that withers in the tongue. 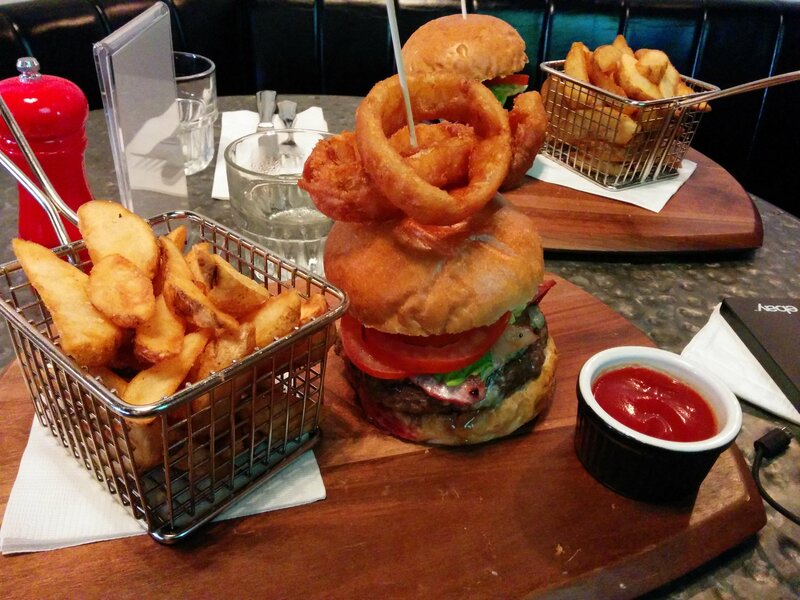 If all this was done on purpose or not, this hamburger certainly shows planning and care. Top Blade Steak Lab’s ultimate burger is an exquisite hamburger. The burger substantiates itself as a capable hamburger experience – showing an astute range of ingredients and intricate planning to result in a well balanced burger taste balance and a polite burger construction. Off the beaten path, somewhere in Mong Kok East – a place not known for many burgers, this hamburger sure deserves a sampling. The ultimate burger arrives in its upmost manner, up and tall, and with a blade pierced through its core – a testament to it’s size. Placing the knife aside, a grasp of the burger’s contour fills one with an aptitude of burger-love it has been given, a comfortably conformed bun-to-patty ratio. What follows, a studious burger taste balance of laborious studies, is a testament to the ‘lab.’ The burger feels and tastes soft, each segment, from patty to bun, is delightfully tender with a savoreous sweetness. The bun, glistening in shine, is pliable and with a bready hint of palatableness; though with time, all too delicate and too soft – a detriment to the burger’s build. The beef patty shares the ethos of the lab, it is clean and well put together, and with only a handful of diced shallots to assist the taste. It’s seasoned with a hint of pepper and salt, all with the hypothesis to bring out the beef cuts in the hamburger. The parts feel soft and tender, slivering with every bite. Nothing in the hamburger’s burger taste balance is overbearing – the caramelized onions, sautéed in red wine, add a frivolous acidity onto the burger; and the cheese, gooey around the patty, is soft and emanatingly mild, enough to provide a subtle cheesiness to the whole endeavor. Then the nacho bits came to play… in a hamburger so soft there should be some sort of a crunch – was the thought. Something worthy of a mark in changing the texture of this ultimate burger. The nacho bits did just that… simply in a weird an awkward manner. The nacho-flavor, their texture and sogginess after moments – all had no place in this burger, it was an experiment with an maladroit result. For HKD160.00 (HKD80.00 during lunch time) this is a burger to try. The fries, which come in unlimited quantities and with a hint of truffle, are a welcomed addition. The ultimate burger, as stated in the menu, has received maximum love. 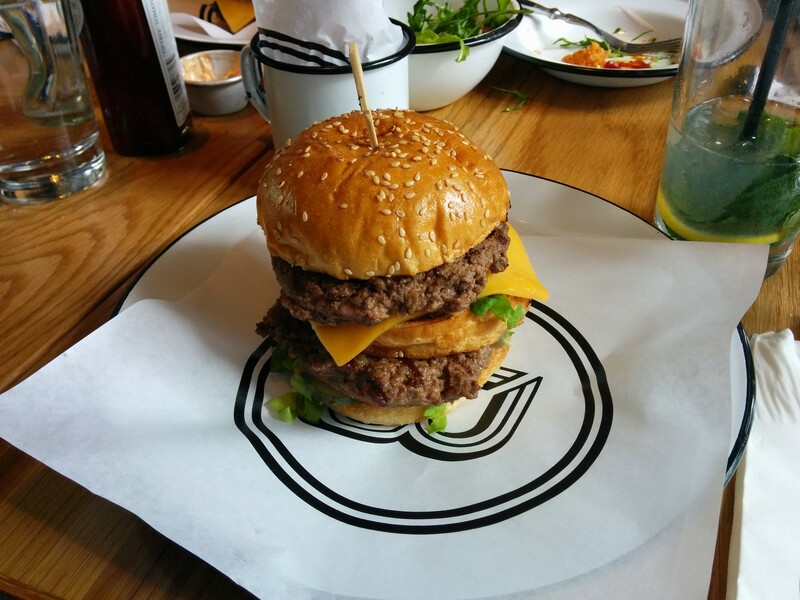 Carefully planned, the hamburger is a great experience for the most – the nachos was a risk worth not taking. Hong Kong is a city that savors burgers as much as any other city – one can find the usual suspect scattered around in almost every corner, there are plenty of home grown burger joints playing the city’s burger-politics, and hamburgers are on the restaurant menus of cha chaan tengs, Michelin starred locales, and everything in between. With that in mind, recently, together with Eat and Travel and Apply Daily, I visited four very local burger joints… four honkie hamburger places. We visited 時新漢堡飽 (Sze Sun Hamburger), which has been around since the 60s and is Hong Kong’s first dedicated burger joint; as well as 嘉寶漢堡 (Kabo Burger) that first open in 2015, far up in the New Territories, and now has a second location in Tsim Sha Tsui. We toured 新嘉美茶餐廳 (New Ka Mei Restaurant), which has the most exquisite cha cheen teng hamburger one can try, and tried our luck at 樂景快餐店 (Lucky Snack House), where one might encounter Hong Kong’s most disgustingly repulsive burger. 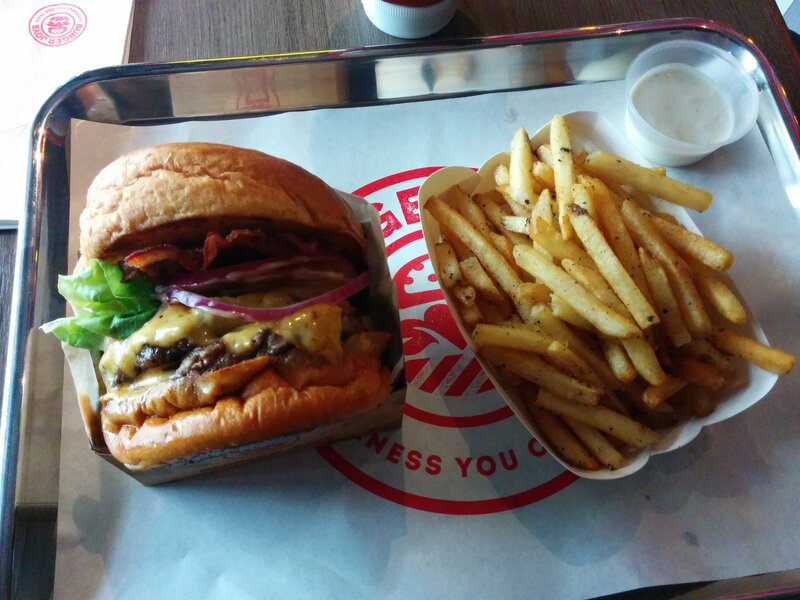 Hongkongers, both foreign and local, experience a delightful fervor with the arrival or opening of a new burger joint. Yet, they also tend to take hamburgers for granted – not overanalyzing a burger’s burger taste balance or the burger construction (probably true for most people and most foods), a burger is just a McDonalds away (which isn’t a bad thing). With good and bad options and a global set, Hong Kong has a rich burger culture, but the thing that stands out the most is it’s burger-duality. One might not realize it, but I find that there are two types of burgers in the city – hamburgers that cater to western tastes and burgers that serve to satisfy local ones. The difference is simple – it’s all in the patty. The former, the western burgers in Hong Kong, tend to have a clean minced beef patty, slightly seasoned with salt and pepper and with little handling of the beef. The local taste is represented in the form of a meatloaf patty – heavily seasoned, laboriously handled, and with a springy texture. It’s really down to the preference of the individual, both minced beef and meatloaf patties can refine or sabotage a burger if not handled correctly. Personally, I’m more of a purist. Honbo’s cheese burger is an exquisite hamburger. Its simplicity is what makes this burger special… no frills, no phooey, no nothing but a simply good hamburger with a patty and bun to please. The honbo (which, by the way means burger in Cantonese) showed up late to the hamburger scene and set up shop in Wan Chai, amongst the reigning big boys of Hong Kong’s burger spot. It wasn’t until a second try of the hamburger, several months after its initial opening, that Honbo decided to make a stand for itself – thoroughly delivering on the hamburger promise every burger joint pledges. Honbo’s burger taste balance is smart and solid. The ingredients, mostly locally sourced, all work together to show great care in the making of this hamburger. From the buns to the beef, and across the veggies and cheese, sauce and bacon, the burger delivers a goodness that’s only lacking a bit more beef… the modestly thin patty barley makes a stand against the rest of the ingredients; but when it looms it is a delightful appreciation for a meaty beef flavor touched with a slight of seasoning to highlight what’s already there. The bun is then the more prominent attraction in the hamburger. Made with potatoes and milk, the bun fits as comfortably in one’s hand as it does cradling the innards of the burger and its balance. Soft, starchy and downy, the bun mellows with a defined doughy tang. The rest of the ingredients play their parts… the usual veggies – lettuce, onions, and tomatoes, are crisp and round with a sweetness that will be embraced by anyone’s tongue; the cheese drapes across in both shape and savor; and the sauce nips with a rich piquancy. And then there’s the bacon, the hulkiest of them all… it is a crisp chewy empowerment, making strides that leave a salty goodness behind. The burger construction is hearty… this honbo will hold itself together beyond the few moments of panic were a seemingly flimsy patty could tear itself, it doesn’t… except when one bites into its soft tenure. With care and thoughtfulness one should be able to endure and accomplish what is a 呢個漢堡包真係好正 (really good burger experience). For 98.00 HKD this is a burger to try, and for 15.00 HKD add the bacon. The fries are just alright. Take the gamble… visit Honbo and explore a new burger, you might not go back for a while, but eventually you’ll return to this little burger joint that’s making it right. The trucker burger from Burgerman is a decent hamburger. 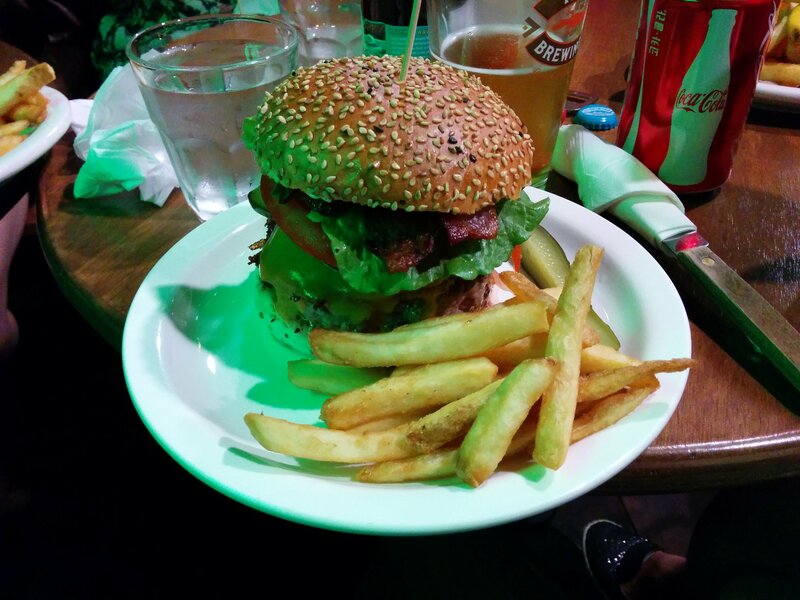 The burger is big… like a mighty truck. It stands up with a hulking burger construction, a freight that brings familiarity and desire for that big burger gratification feel. The feeling of holding and commanding something huge and burly, a massive hamburger that’ll dampen one’s sense of taste, and eventually leave behind a feeling of glut that was never asked for. Regrettably, the handling and consumption of the burger is ditched on its first impression; after a few bites the trucker burger becomes a pile-up of past decent hamburgers, of the many home made burgers that may satisfy but aren’t all that distinctive. The burger’s burger taste balance is steered by a range of commonplace ingredients; the same hamburger items that many have experienced before, that have shaped countless burgers with a sense of placidness. The purity of the beef taste is driven out by heavy amounts of seasoning, trucking a taste of hamburger mediocracy. The cheese being hauled is nothing more than a couple of singles used to add a cheesy feel to the load. The fried egg has burnt-out beyond its greatness, drying up the runny goodness that is the yolk fluid. And the bacon handles with a crisp chew that is dimmed by a single strip. The burger construction, rolling in impressively at first, disappoints with the first grab and bite… each mouthful is a constant breakdown of components that haven’t been stacked or planned for. One has to back the hammer down as meat chunks of sizeable proportions fall out of the burger. The meat’s better half, the bun, hauls itself with a great taste before it backfires from the barreling size of the hamburger. Nearing the final marker will be a messy plow that requires many stops and continuous burger repairs. For 100.00 HKD, which includes some good fries and a drink, this burger is a drive down a long and familiar road, one that has been driven on countless times, that doesn’t offer any new experiences. If anything, this hamburger might make a trucker out of its handler… operating big equipment, knowing when to stop and speed up, getting down and dirty, and getting the whole thing into that tight spot. Once the trucker burger is served one’s in it for the long haul. The first bite isn’t bad, it won’t taste awful… it just doesn’t feel right, and every succeeding bite adds to the uncertainty of honesty. The Beyond Burger’s “burger” taste balance is an uncompromisingly false reproduction of a hamburger. The patty, comprising of stuff like pea protein isolate, refined coconut oil, maltodextrin, and natural flavors, tastes as if it’s trying to hard to be factual – a distinctive acidulous taste of grill that is not is professed. The cheddar cheese, a glue like substance that’ll fuse parts of the “burger” into solid blocks, cues a nutty acetic like cheese substance that sticks to one’s teeth. It’s the uneasy feeling of deceit… the perception of eating something phony, no matter how good it claims to be, that doesn’t sit right in one’s judgment. At least the veggies and bun give a glimmer of hope in this dismal burger future. In grandiose form, the avocado fills each bite with its creamy effervescent greenery; and the bun is crisp, soft and tasteful. The burger construction is tenuous, not only from a lubricious layer of avocado that constantly slops, but from a patty texture that feels as delightful as a mouthful of small chewy pellets with a cartilage like texture. For 108.00 HKD one should try this fradulous “hamburger,” if only to experiment. As a burger zealot the first step might be full of skepticism and low expectations, but it’s important to keep an open mind… to try new things. The beginning is better than you might think; but still, the insincerity of this “burger,” the artificiality of its taste, will eventually make the last interaction, the last bite, a disappointing incident. Walk out and look for those burgers that awake feelings, that make you feel free. The best burgers… are those that are honest and tell you what you already know. Quarter Master’s beef burger is an exquisite hamburger. The burger is supplied with a decorous range of ingredients; from the beef all through to the bun, the components form a well standing burger taste balance. It is not until one is well entrenched in some bites that the burger begins to show its shortcomings – that every munch, every mouthful, denotes the hamburger’s need for a little more beef, a bit extra cheese, a second smidgen of sauce. On its arrival a golden-brown sheen follows the burger in its wake; a beautiful bun that causes this glimmer to crave takes charge with a soft mild sweetness to savor one’s palate. Veins of meat juice, emanating from a patty with a righteous beef taste – untouched from heavy seasoning, and textured so that it gently pulls itself apart, collect and run down through the bottom bun in good measure. Rows of delectable bacon, though slightly undercooked, overlay the burger with judicious touches of salt that burst with each chew. Adversely, the cheese barely manages to leave a mark. The tomato provides the hamburger and bun with an enjoyable tangy feel that stands solid for a single vegetable layer. Then there’s the sauce… this beautiful rich aioli mixture, a thick mayo-ey cream that is formed with a touch of black garlic as its essence, a sauce that binds to the sense of taste in luscious form. There just isn’t enough of it in the burger… really. You see, without the bun all these ingredients would do a marvelous job, but it is the bun that commands this burger’s burger construction and subsequent burger taste balance. Its size lessens the impact of the flavors reducing the spirits of the other ingredients, ingredients that simply haven’t been sufficed to match the correct ratios. It might be hard to notice at first, but it will happen, one’s taste will crave for a little more, for just a slight extra. For 90.00 HKD, plus 30.00 HKD and 15.00 HKD for cheese and bacon respectively, this is a burger that is well worth a try. It’s a burger that has positioned itself within the ranks to deliver a great hamburger experience, the fries are great (with the sauce better); but the burger simply needs a dollop, a spoonful, a chunk, a sliver of each of its ingredients for it to truly rise above. It needs to master its quarters as to adequately provide what is necessary to be all that it can be. 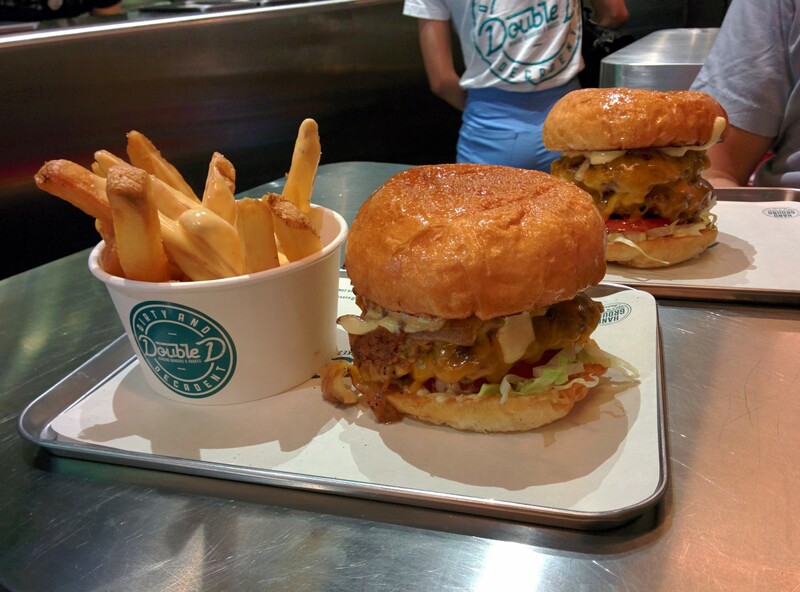 Electric Ave’s classic Aussie beef burger is an exquisite hamburger. It has a notable burger taste balance, but missing is the Aussie feel to it… This won’t detract from the overall hamburger experience, except the expectations one may have. Australian burgers, much like everything else coming up from the down under, should be a mix and match of nonsense ingredients. Ingredients that perhaps should not be in a burger, but somehow are and for some strange reason they kinda work. Moving along, the crumbly cheddar cheese isn’t spewin’ what one might expect… the taste won’t crumble and touch your buds, leaving a flamin’ desire for a more cheesy experience. The sweet cooked onions, which aren’t obvious to be onions at first, bestow the burger with a savory tanginess. There’s also the tomato paste, which provides the hamburger with a ketchup-tomatoey feel without them being present. The burger construction is lacking though… every bite is a legless feel and dread of a hamburger waiting to plummet at any moment. Then without warning, bits of beef begin to fall and the burger’s life fails in your hands. Burger Joys Signature Double Cheese Burger is a majestic burger. The hamburger, from its beginnings to its concluding moments, to everything in the burger in-between, proves to be an invigorating hamburger experience – it is a burger that has had its dutifulness devotion given, a beautifully coordinated hamburger, as it becomes obviously hard to find any form of wrongdoing. Both the burger taste balance, balanced with an appetizing enthusiasm that will unite burger and soul into blissful accord; and the burger construction, robustly constructed for a meld of hands and burger to a comfortable sturdiness, will deliver a mesmerizing experience of complete hamburger gratification. The burger’s aroma, rising thought the seedy Wan Chai air, grants one with a beautiful hamburger introduction that makes the impending first bite a moment of desire to get excited about – a worth of carefully refined components that tastefully copulate in one’s mouth making each mouthful a pleasurable joy to experience. The ingredients; from the burger’s center core – two patties that dignify meat with a wholesome taste of beef that has been subtly seasoned to create a capstone, patties that exist with a tearable sufficiency that softly rips the beef with each ditching bite, entrenched in a delightfully balmy creamy-esq cheddary cheese that is well represented in the overall experience. To the mid-levels of fresh crisp vegetables – a silky firm flowery lettuce, a crunchy slice of thick yielding onion, a plump juicy tomato; all smeared in a tangy secret sauce of oily quality that adulterates itself to the balance with a faint embrace. Topped with a brittle bacon that fractures with the grasp of the bun releasing copious amounts of flavor with each crack. To the outer edges – a soft and spongy bun that adapts to the shape of one’s hold and the inner workings on the burger with a respectful level of compression and pulpy absorption, holding everything together with an amusing doughy taste… All, with ideal ratios, culminate in a ceremonious burger taste balance and burger construction. The truffle fries are awesome. For 138.00 HKD one must try this hamburger – Burger Joys offers a burger that doesn’t presume itself with any gaudiness; within a small cramped space towards the end of Wan Chai, this true burger joint has fathomed the simplicity of a burger joint hamburger, a burger with the right ingredients and burger care, a magnificent burger that radiates burger joys. The Saint’s Gourmet Burger is a decent hamburger. The burger’s first impression, a hamburger that is ready to be taken by a cradling mouthfeel, is one of immediate satisfaction; as burger essences ooze from one layer to another, collecting into a bantam pool of want, a sense of elation causes hunger to forswear. Not until the first bite, the first mouth touch, does the burger begin to reveal its true character, to unravel itself into a mediocre burger taste balance that’ll leave one troweling through a range of ingredients, many that have been seemingly neglected. The burger, both in its burger taste balance and burger construction, is plagued by a rigid fatigue, by an old dryness that has subsided the freshness and vitality of some ingredients long ago, leaving behind, for the most, only appearances and illusions. The bun enacts one of the principal letdowns, golden and professedly firm with a crumpleness that adheres to the rest of the burger; it exists with a faded texture that, even beyond the release of meaty juices, eventually turns the burger stale. The beef patty is thick and flowing yet thirsty in its chunks, a good beef flavor within the first instances of the burger eventually dwindles into something ominously un-energetic, as if a hard glaciate had withdrawn most of its vigor – leaving a somewhat musty legacy in one’s mouth. Other aspects of the burger don’t call much attention to themselves, their roles in the burger taste balance pass along without question. The vegetables, the tomato and the lettuce, had the taste one would expect accompanied by a suspicious softness – not a texture one might be looking for. The blue cheese has a fragrant savor that will chance itself the opportunity to overflow the burger, not always in one’s best interests. The bacon, probably the standout ingredient in the burger, exposes itself with an equitable saltness and a thick texture. And the onion rings, oversized with a thick oniony crunch, are a little over the top. The fries are alright. For 168.00 HKD, plus 10.00 HKD extra for toppings like cheese, bacon and onions rings, this burger is pricey and common; it is a hamburger experience that climaxes on its introduction with its sight, smell and feel, that ultimately abates itself with each bite into becoming a simple decent burger. Gilbert’s Burger, the Mr. President, is a majestic burger. This personable burger, with a name to reflect aspirations of hamburger greatness and an inconsequentially humble menu descriptor, is sure to instill a long lasting burger impression; the discourse delivered by this burger’s burger taste balance and burger construction demonstrates charisma, it shows burger expertise… every bite, every touch, every taste of this burger is one vote towards a momentous hamburger experience that will draw out one’s burger inspirations, that will emote hamburger pride, that’ll promote burger greatness in both Seoul and the world. As the burger arrives, under a cool green light that radiates from a confounding slogan that claims ‘green is hotter than red’ and with only word-of-mouth views of satisfaction towards this burger joint, an eager wait is filled with prodigious contemplation as lungs are suffused with burger elation, eyes inspired with hamburger aesthetics, and taste drenched in a tremendous burger taste balance – the deliverance onto one’s senses become an eloquent pleasure to ingest from a succinct range of profoundly rich ingredients. The teamwork represented in the components is impeccable, with the greens as the burger’s only slight drawback – not having had a chance to comfort in, the veggies are too cold for the rest of the burger. It won’t matter much though, as the romaine lettuce is crisp and lush, the tomato firm and juicy, and the chunk of red onion surprisingly subtle; beyond that, the rest of the ingredients gleam in brilliance. The beef is assertively tasty – each articulately teared mouthful is a passionate embrace of beef, of a patty that is smartly seasoned and expressively juicy. The bacon, with an unyielding reddish-brown that looks and feels brittle to an easy crumble, manages to rouse the meat experience with its baconesque saltiness. The burger construction and its different textures are marvelous – staged to a stability of enjoyment, everything is kept in place with minimum spillage. The cheese is fruitful with a grading sharp cheddary taste, and bears an exciting earthy texture that melts itself in exquisite particles; the bread is select and supple, appetizing and able, carrying the burger and a hearty sesame leave-behind. The horse radish mustard mayonnaise is present without being domineering, and the fries are good. For 12,500 KRW (84.00 HKD) this is a burger one has to elect to try; found in the heart of Seoul, lacking any sort of burger localization, this is a hamburger that will deliver on all its burger promises, one that can rightfully be called the Mr.프레지던트. 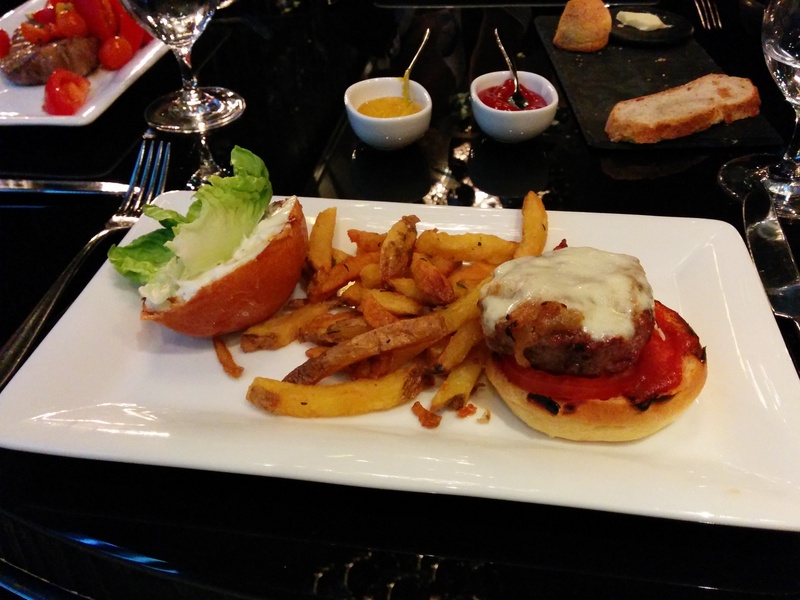 The Gaucho Burger from Gaucho is an unimpressively edible burger. From hamburger taste balance to burger construction, this trifling hamburger defers an accomplished misfortune that is expeditiously established at its first appearance; a downward spiral is re-enforced by what else might arrive at the table, and constantly insulted by the amount of cow that exists, compared to the burger, in the surroundings. This burger is an exemplar example of how an intriguingly worded hamburger is not necessarily rightly executed – a mediocre burger taste balance a meager burger construction lead to pure unadulterated disappointment. A string of words on the menu will be enough to excite one for this burger’s burger taste balance – ‘a blend of four cuts’, which cuts of meat one does not know, but a patty made from four cuts in an Argentinean steak house… its appealing, enticing, an invigoratingly sounding patty one needs to taste. Once it connects with one’s palate there isn’t much to say. Not much to enjoy except a seasoned blandness that exists within the realms of a boring common carefree houseburger. One would hope ‘smokey bacon’ would enliven the burger’s balance – not smokey, not salty, nor crispy, knowing where the patty ends and bacon starts becomes a cloyed venture lacking bacon excitement. The more bites one takes into the burger the more the debacle subdues. The caramelized onions don’t entail any semblance of sweetness, and even the strapping white provolone, with a tepid mildness, shows little effort. The lettuce and the tomato have a saving green, but there’s little point to it. Even the sauces on the burger, both the garlic mayo and homemade ketchup, leave an unmemorable impression. One has to look around, one has to consider what’s at hand and MacGyver this burger to make it work – the Chimichurri, herbs and oil rich in flavor – it’s impulsiveness will have something for this hamburger. The burger’s slight build is enough to chafe one’s empty stomach, the sheer size of the burger seems unworthy of four meat cuts and every morsel taken substantially increases one’s hunger; the burger, professedly tossed on the plate, does hold its shape. The bread, soft and acceptable, maintains the burger with a chewy compression. The fries are alright. At 230.00 HKD the burger comes as part of a lunch set, unsure if the dinner burger holds the same experience, one can skip this burger… there are better Argentinean burgers in the area. Double D Burger’s Double D Burger is an exquisite hamburger. This is a burger that’ll do the deed, a double delicious hamburger that’ll leave one with an inkling of depravity. A feeling that dawns with alluring eyes befalling onto a burger that is gleaming with shine, that carries on with the first dabble between tongue and burger engulfing taste and body in an doused and dampant, slightly wet and exciting, mixture of burger juices and hamburger grease; an intimacy that promptly fulfills any one’s burger aspirations with a rousing burger taste balance characterized by a doable delectability. The burger’s burger construction, seemingly well stacked, and at first firm between one’s fervid touch, is plagued with salacious amounts of perspiration and fat – savory loads of sauce and oils are felt by laying eyes, as one might almost experience grease coming out of one’s eyeballs; by gentle hands that won’t want to let go despite the subsequent lustrous slippery build; by frivolous taste buds, that persist for that desired burger taste balance that relieves a dashing mix of a racy ardent ingredients. It takes one bite, a first enormous nibble around the two patties and buns, to get instant bur-gratification as all the ingredients come to dazzle one’s mouthfeel with a resplendent combination of themselves. The two patties, which might seem as an overload on the outset – they aren’t, have a grabbing texture that tear into lively meat bites that add to the already debonair beef palatableness with its inviting salted seasoning. The rest of the ingredients form a titillatingly basic burger; the cheese grapples the burger with a crude mild gooeyness and a wrapping flavor; the cooked onion has an entertaining tickle that is both silky and zestfully sweet, and the chopped lettuce and slice of tomato – covered in a myriad of juices, lose their green innocence. The buns, lustrously covered with an lewd dipping layer of butter, project a soft darling firmness that dwindles as they become smeared in the burger’s nectar – the comparative ratio between buns and meat works well… It’s the sultriness that slowly diminishes the burger’s texture and build. The fries are good and quite dense. Beef & Liberty’s The Big Ron Burger is a majestic hamburger. It is an appreciation to one of the greatest hamburgers of all time, and with heartfelt reverence, this burger has embarked on the onerous task of fulfilling a burger taste balance that has indulged one and so many with sentiments of joy and elation. Embracing its own origin story, The Big Ron gives the respect its hero deserves while exhibiting its own show of force; the burger is not better nor worse, it is not a replacement to its champion – it is a burger that brings its own character traits to the game, that delivers a refreshing set of ingredients on its own admirable accord. In the light of day, the burger stands tall from its perch – the two beef patties, the special sauce, lettuce, cheese, pickles, onions, on a sesame seed bun, leave a remarkably mettle impression; and while there’s still some room for improvement, particularly in its burger build – skilled burger boldness defines this hamburger. The two patties show their cojones through a laudable beef taste, differing from the original, they are juicy and hearty; but show vulnerability in a soft texture that frails the more one delves into them. A special sauce is good, it gives the burger a robust tang without subduing the burger taste balance, allowing for the rest of the ingredients to show their valiance. The finely chopped lettuce and white onions, a subtle green resolve for the burger, maintain a crisp stance; whereas the slice of cheese, audaciously mild and yellow, flows with the hamburger’s savor and movements. The suit that holds the burger, the trinity of sesame encrusted buns, the three firm layers of bread with a pluck taste, work well with all the hamburger components – never overpowering, holding fast, and reconciling the juices. The burger’s bane, its debility, comes from a burger construction that slowly weakens; just like the original, when first revealed, the burger carries itself with a stackature of gameness, but with each lift each impending bite, components in the burger construction begin to shift… still, it’ll strive to hold itself together, to deliver one good last mouthful. The fries (not pictured) are great. For 158.00 HKD this is a hamburger one had to try, because it is a burger that Hong Kong deserves, but not one it ever needed, so one has to eat it. Because it can take it, because the burger is not a regular menu item. It is a majestic burger, a tasteful hamburger, The Big Ron. 2/F, 23 Wing Fung St.
*It was with a great smile and enthusiasm, that Beef & Liberty invited me to try this awesome burger.